In the previous article, we have shared some tips on how to win NBA 2K17 MT from Moments Challenges. Do you want to earn NBA 2K17 MT through Auction House easy and fast? Today we'll share a great way to achieve the goal. Using this easy method, the earnings will depend on your activity and the market status. 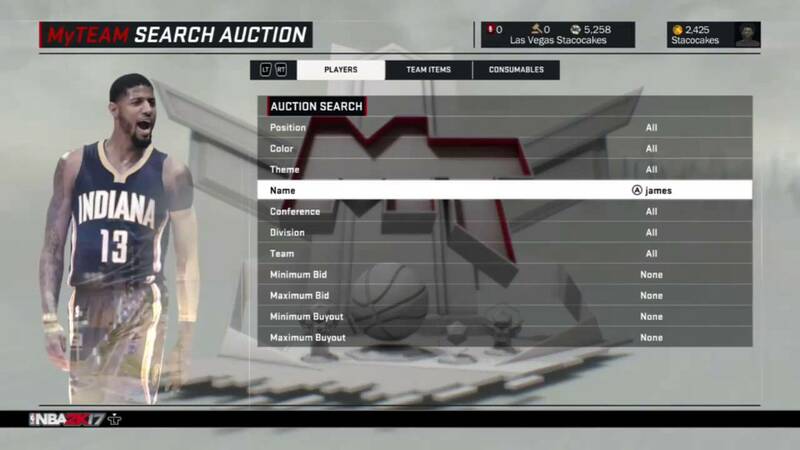 Want to know how to earn a nice amount of MT rapidly in Auction House then check out our tips and tricks below. To begin with, you need a solid amount of MT. Considering the investment which will make you a nice income after a certain period of time, the more you invest, the greater potential for income there is. The cards that come from the Pack Market are always in demand, since players are trying to complete their collection, and they contain some of the best players. There will always be some new challenges for you to participate in, and high-demand cards on the market since NBA 2K17 follows the trends of the official NBA season. You need to be aware which cards are in demand at the moment. For example, if there is a moments challenge that requires that you use Chris Paul and make 20 assists in one game, his card will have a high demand on the market. Many players will buy those cards off the auction house without checking their current market value. Consider writing down all of your purchases and calculate them. You should avoid mistakes since they can be costly. Check the auction house and search for the average price of the target card. You should consider buying cards that are below average. Sell those cards afterwards, but keep in mind the 10% listing fee. Your selling price needs to be 10% higher than the price that you paid for the card, plus your own earnings. You can freely sell the card back at 20-30% more MT for a solid income. The word "Snipe" refers to how players can buy high-quality cards for lower the price. Basically, players will be spending as low as possible for the best cards in NBA 2K17 MyTeam. If players buy high-quality cards at a low price and then resell it at its normal price in auction block, then players will earn more NBA 2K17 MT than what they've spent. The more cards that you snipe and sell back, the more you will earn. Naturally, the auction house is much more active in the evening and on weekends, so take that into consideration. If there is an active challenge that requires, for example, 4 Kings players in your lineup, all of the Kings players will have a higher demand on the market, especially the players with lower rating, since they are cheaper. In that case, buy some cheap Kings players and resell them for some easy profit. After that, what you need to do is being patient because the results will not immediately appear as you expect. What do you think of this method? Be sure to stay tuned for more "NBA 2K17" news, tricks, hacks, and cheats.